I recently posted two McDonalds spots on the ongoing coffee wars between McDonalds, Starbucks, and Dunkin Donuts. I feel like this is only the beginning, who knows what else will happen! Starbucks and McDonalds are both launching new marketing campaigns but both have a different message. Starbucks looks to persuade consumers that its coffee is superior while Mcdonald's is trying to build a quirky new brand around its mochas, hot cocoas, lattes and cappuccinos. McDonald's newest tag line looks to "McCafé" the days of their customers. My recent post shows the new tactic McDonald's has used, and they are portraying McCafé as a fun, affordable brand that can make even the most mundane daily tasks more enjoyable. The commercial I posted shows a woman standing at a bus stop looking annoyed, while a smiling man holding a McCafé mocha has turned his commute into a commuté (pronounced commute-ay, to rhyme with McCafé). 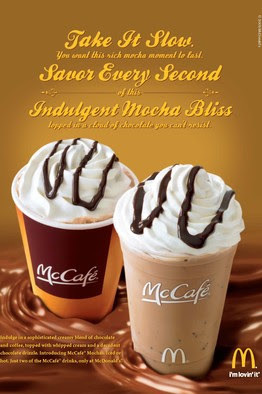 The ad goes on to say that McCafé makes a better day "possiblé." Who knows what will happen between these companies but lets hope for cheaper drinks and how about some more promotions...I always liked those! Although I don't drink coffee (used to, now prefer tea) I enjoy the ads these creative companies come up with. Starbucks is more than coffee, it is really a social experience as you can see when you stop by any Starbucks and notice what is going on. People may meet for coffee at McDonalds, but I bet they don't take clients there. At least not the colleagues I know. So yes, you pay more for the coffee, but when you are talking to a million dollar client, its all about perception. I live in New York City and McDonald's doesn't try at all to sell coffee here. All their commercials are geared towards burgers and sweet tea. Dunkin Donuts has redone itself though... there are still some old nasty ones, but most are new, clean, and have dudes sipping lattes writing haiku. I believe these brands are now competing in a price war and communicating value via generic slogans. Any coffee can be savory, blissful, or free of bad aftertaste. Dunkin and McDonalds are free to compete in this price war but I'm disappointed to see Starbucks falling into the trap. The strategy should communicate a higher value that commands a premium price. And when you are the third player in the morning breakfast trap, the competition is only going to get nastier and cheaper. Great comment. I completely agree with what you said about Starbucks being a social experience, and I highly doubt people would take prospective clients for coffee at McDonalds. However, as the comment above mentioned, why is Starbucks even competing in this "coffee war" with McDonalds? 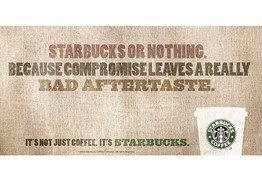 If Starbucks is trying to portray higher valued coffee, tell the consumers why they pay the price they do! Starbucks needs to figure out what exactly they want their consumers to believe. Hope that product of McDonalds will be available in our country. Thanks for the comment. If you don't mind me asking, what country do you live in?